Home > Books > What Is a Computer? 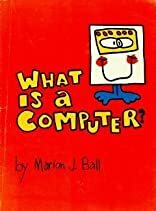 A brief history of the computer and explanations of the functions of different models--what they do and how they do it. About Marian J. Ball (Author) : Marian J. Ball is a published author of children's books. Published credits of Marian J. Ball include What Is a Computer. About Barbara A. Heisler (Illustrator) : Barbara A. Heisler is a published illustrator of children's books. A published credit of Barbara A. Heisler is What Is a Computer? (Houghton Mifflin Modern Mathematics Series).